Behavioral variation within and between populations and species of the genus Papio has been studied extensively, but little is known about the genetic causes of individual- or population-level differences. 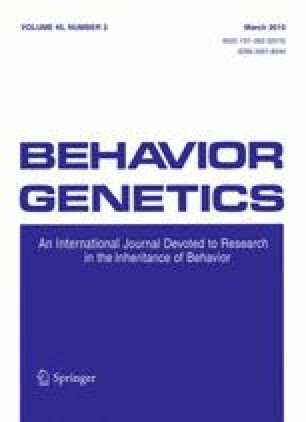 This study investigates the influence of genetic variation on personality (sometimes referred to as temperament) in baboons and identifies a candidate gene partially responsible for the variation in that phenotype. To accomplish these goals, we examined individual variation in response to both novel objects and an apparent novel social partner (using a mirror test) among pedigreed baboons (n = 578) from the Southwest National Primate Research Center. We investigated the frequency and duration of individual behaviors in response to novel objects and used multivariate factor analysis to identify trait-like dimensions of personality. Exploratory factor analysis identified two distinct dimensions of personality within this population. Factor 1 accounts for 46.8 % of the variance within the behavioral matrix, and consists primarily of behaviors related to the “boldness” of the subject. Factor 2 accounts for 18.8 % of the variation, and contains several “anxiety” like behaviors. Several specific behaviors, and the two personality factors, were significantly heritable, with the factors showing higher heritability than most individual behaviors. Subsequent analyses show that the behavioral reactions observed in the test protocol are associated with animals’ social behavior observed later in their home social groups. Finally we used linkage analysis to map quantitative trait loci for the measured phenotypes. Single nucleotide polymorphisms in a positional candidate gene (SNAP25) are associated with variation in one of the personality factors, and CSF levels of homovanillic acid and 3-methoxy-4-hydroxyphenylglycol. This study documents heritable variation in personality among baboons and suggests that sequence variation in SNAP25 may influence differences in behavior and neurochemistry in these nonhuman primates. The online version of this article (doi: 10.1007/s10519-014-9702-6) contains supplementary material, which is available to authorized users. Zachary Johnson, Linda Brent, Juan Carlos Alvarenga, Anthony G. Comuzzie, Wendy Shelledy, Stephanie Ramirez, Laura Cox, Michael C. Mahaney, Yung-Yu Huang, J. John Mann, Jay R. Kaplan, and Jeffrey Rogers declare that they have no conflict of interest. This research was funded by National Institutes of Health grant R01-MH65462 to Jeffrey Rogers.